Making decisions is one of the main activities of the teacher’s work. Considered or apparently unconsidered, these decisions significantly affect the lives of all who work in classrooms, both children and the teachers themselves. 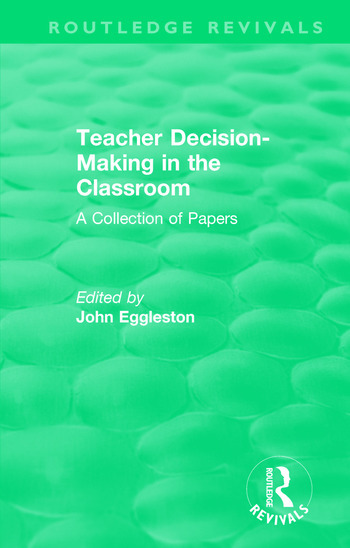 Originally published in 1979, the aim of this collection of papers was to achieve greater understanding of classroom decision-making and its consequences, to identify and map existing knowledge, and to indicate where it might be augmented. The contributors were researchers and teachers from schools, universities and colleges at the time, and they examine the process of teacher decision-making from sociological, psychological, economic and other perspectives. The book includes a detailed analysis of life in the classroom from a phenomenological perspective, explorations based on micro-economic techniques, and structural perspectives on the role of the teacher in the school. The concluding papers examine the possibilities for social change, given the constraints on the work of the teacher. Notes on Contributors. Preface. 1. Editorial Introduction: Making Decisions in the Classroom John Eggleston 2. Classroom-based Teaching Decisions John Sutcliffe and Richard Whitfield 3. Teachers’ Implicit Personality Systems: An Exploratory Study Mervyn Taylor 4. Ideology, Reality Assumptions and Teachers’ Classroom Decision-making Douglas Finlayson and Sylvia Quirk 5. A Phenomenological Approach to Classroom Decision-making David H. Hargreaves 6. Decision-making in the Classroom: A Microeconomic Analysis Keith Drake 7. Towards a Political Economy of Decision-making in the Classroom Paul Bellaby 8. Control in the Comprehensive System Colin Hunter 9. Strategies, Decisions and Control: Interaction in a Middle School Classroom Andy Hargreaves 10. How Teachers Decide Pupils’ Subject Choices Peter Woods 11. Towards a Model of Teacher Activity Martyn Hammersley 12. Curriculum Development and Social Change: Towards a Reappraisal of Teacher Action Denis Gleeson 13. Autonomy and Organisation: A Theoretical Perspective on Teacher Decisions George Mardle and Michael Walker. Bibliography. Index.